Today...I thought I would create a tag using one of my favorite Collage sheets that I designed a couple years ago. The original piece I made using the sheet was the ornament below. You can see view my original blog post of how I created it here. How To Video Tutorial here. And the second Ornament from that same collage sheet you can see here. That is two super cute ornaments from One print out of the sheet. I know a few of you who have this sheet and there are some of you who do not, so I thought I would go ahead and create another beautiful project using the same sheet. I cut out all of the pieces I thought I would use from one print out of the sheet. Inked all the edges with Frayed Burlap distress ink. I placed my Star image on the tag base. Here is the back of the tag....I used the other star base...lined them up so the back would look pretty too. I also used Rosemary Crochet Lace. 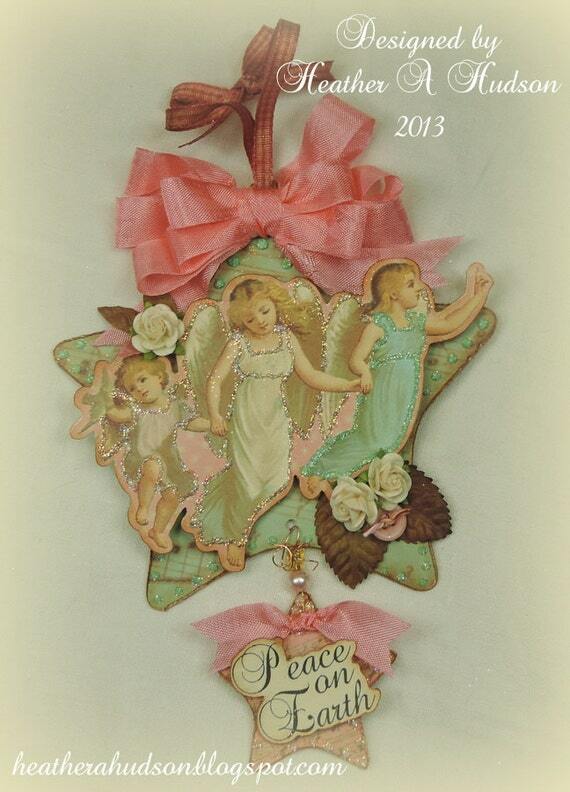 I added some Tombow Foam Tabs to the back of my Angel image. Then decided I would tuck the other creamy star under the angels. But first I want to add something to it. I used more of the Rosemary Crochet Lace, on top of another ribbon that is not available anymore but...I think that the Ivory Grossgrain Ribbon , would work here, since it is covered up with the lace. I used Scor tape to put my large star and my pink little star on top of my creamy star. I did the same to my cardinal images. I wrapped the Creamy & Pink stars with Cotton Candy Baker's Twine and brought the ends up through the button holes to create a bow. I tucked my favorite Moss green Leaves under the button. If you look at my cream star, I did my best to match up the other cream star on the back of the tag too. I used glue to make sure my button stays in place. I used my Crop O Dile to punch a whole in the top of the star. I added my Merry Christmas text boxes. You know....you could call this tag done at this point if you liked. I decided to add the other cardinal image, another button tied with Cotton Candy Baker's Twine, Moss green Leaves, and a Deep Ivory Mulberry Roses. I thought...you know...it just needs some glitter :0) I LOVE glitter! 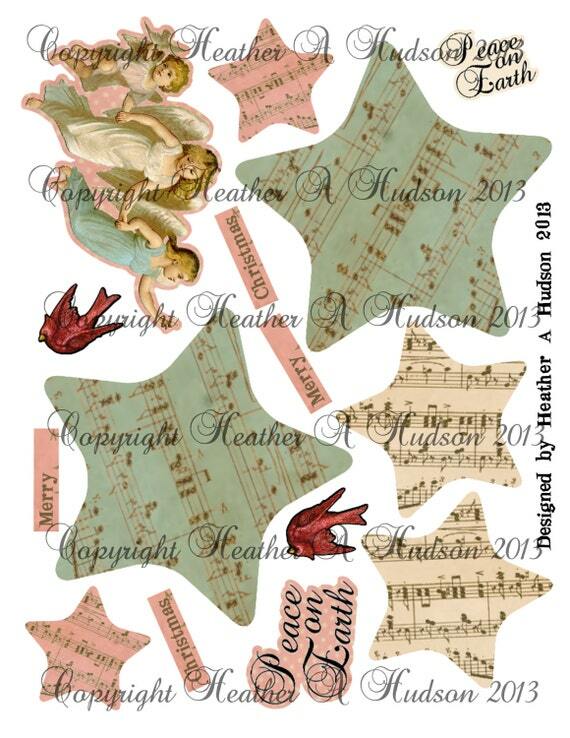 Above I added Fauna glitter from Art Glitter to the edges of the tag base, Angel wings and the one's dress. Below you will see the areas that were covered with the Just peachy pink glitter that is piled on my piece in the photo above. Next I added some Water Color Glitter...to the large star edges. Yummy!! Then I realized I needed to add it to the one Aqua colored Angel dress as well. The smallest Angel ...I added more of the Just peachy color...in my original project I used Fauna. Here is is after it has dried...and I used a mop brush to gently wipe off any excess glitter. I hope you like my new tag. Beautiful makes. I love the glitz, the vintage images, and the way you've connected them. Love the sparkle, many thanks for joining us at Tag You're It Challenge. WoW this is awesome lots of details love it. Thanks for playing along with Tag You're it. At the risk of sounding cheesy, I'd like to say this is angelic!! SO pretty, Heather. You always do such lovely work. Thanks so much for sharing in our Tag Challenge. What a fabulous collage, with so many wonderful details. Thanks for joining in at City Crafter. Detailed delight! How lovely a keepsake for some lucky person. Beautiful in every way. Thank you for adding a touch of glamour to our challenge at Tag You're It! Oh my goodness these tags are simply gorgeous! I find I love added glitter to every card and project...why not! Love the glitter! Beautiful tags! Thanks for joining us at,Tag You’re It ! It's absolutely lovely!! Thanks so much for playing along at CCCB!! Beautiful! Thanks for playing at The Merry Christmas Challenge. Thank you for joining us at WW. Vintage at its best. And a lovely take on our theme. thanks so much for joining us at CCCB! Glittery Goodness! Thanks for joining the Really Reasonable Ribbon Tag Challenge! Gorgeous projects. Love the glitter around them. Thanks for sharing with us at Winter Wonderland.